Nothing makes your yard stand out like beautiful trees on the property. However, over time, those trees may need to be removed, leaving a large stump behind. Though not a hazard for other plants, it’s still best to get rid of old tree stumps in the yard. This makes it easier to plan out new landscaping designs, reduces the risk of tripping hazards, and makes the yard look well-maintained. When it comes to stump removal, there are several ways to get rid of the remaining tree. 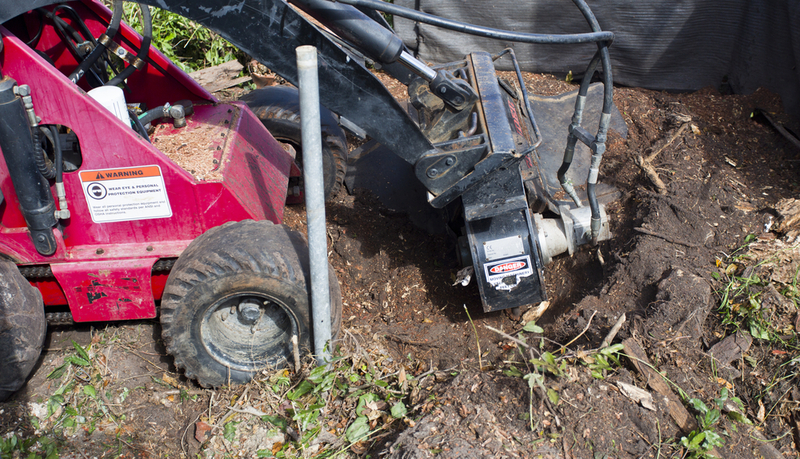 Digging up the remaining stump is one of the most labor-intensive stump removal methods. However, it’s particularly effective for smaller stumps and trees. This process uses a standard shovel to dig up the dirt around the roots of the stump. Once the roots are uncovered, the stump can be removed and the hole can be filled in with the dirt left over from the removal. An experienced landscaping team will be able to take care of the removal quickly. Stump grinding works to quickly remove larger tree remnants and does so without requiring a lot of digging or prep work. Using a stump grinder, you’ll be able to grind down the exposed wood and roots creating sawdust that can be tossed into a compost pile, incorporated into your mulch, or simply thrown away. The grinder leaves about a foot-deep hole in the ground that can be filled in with dirt and covered with a new layer of grass seed. This method is the perfect choice for cool autumn afternoons as it requires building a large fire hot enough to burn the stump to ash in a few hours. Set some cured firewood around the trunk and arrange a few logs on top of the stump to create the initial blaze. Once the fire is going, keep it burning until the stump is reduced to ash. Once the ash has cooled, remove it and fill the hole with fresh dirt. Though burning the stump away does work, you’ll want to contact the county to make sure the fire is permitted. In times of drought or due to other zoning restrictions, you may have to resort to one of the other stump removal methods. Looking for an experienced professional to handle stump removal on your property? Contact WH Major & Sons in Mukwonago, WI. Their experienced staff has helped residents maintain their landscaping since 1956. They have the resources and training required to take care of almost any job on your property, from stump removal to constructing retaining walls. Learn more about their services online and call (262) 363-3115 to schedule a free estimate.